Sony working on new 100MP and 150MP Medium Format BSI CMOS sensors for use in future cameras. 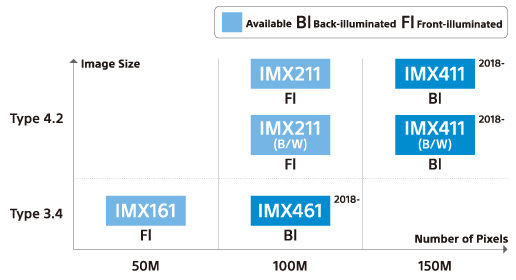 Sony has announced further details of their 100mp and 150mp medium-format sensors with BSI (Back Side Illumination). BSI means that they should give improved noise performance, compared to Front-Illuminated (FI) sensors. The sensors will offer HDR, rich graduation, plus 8K and 4K video recording. The 100mp IMX211 (FI) sensor is currently used in 100mp cameras such as the Hasselblad H6D-100c, and Phase One IQ3-100. The 150mp IMX411 BSI CMOS sensor is due next year, and could be used in future versions of these cameras. The 100mp IMX461 is a 55mm (diagonal) BSI CMOS sensor and is due next year. The sensor is the same size used in the 50mp Fujifilm GFX 50s, Pentax 645Z, and Hasselblad X1D. So the IMX461 might be the next sensor to take on the GFX market - I hope Sony or Nikon are looking at bodies and lenses. Then Canon might follow a year later. Mirrorless and a portable design should have it see in the dark, I hope focus points also work in low light. So the IMX461 might be the next sensor to take on the GFX market - I hope Sony or Nikon are looking at bodies and lenses. Then Canon might follow a year later. Mirrorless and a portable design should have it see in the dark, I hope focus points also work in low light.